I’m a day late with my weekly recap, but that’s because I just returned from a long weekend in Georgia. We were in Jekyll Island for a wedding Friday/Saturday, and then spent Sunday exploring Savannah. It was a great trip! I will post a “Fits on the Road” post soon sharing our travels! 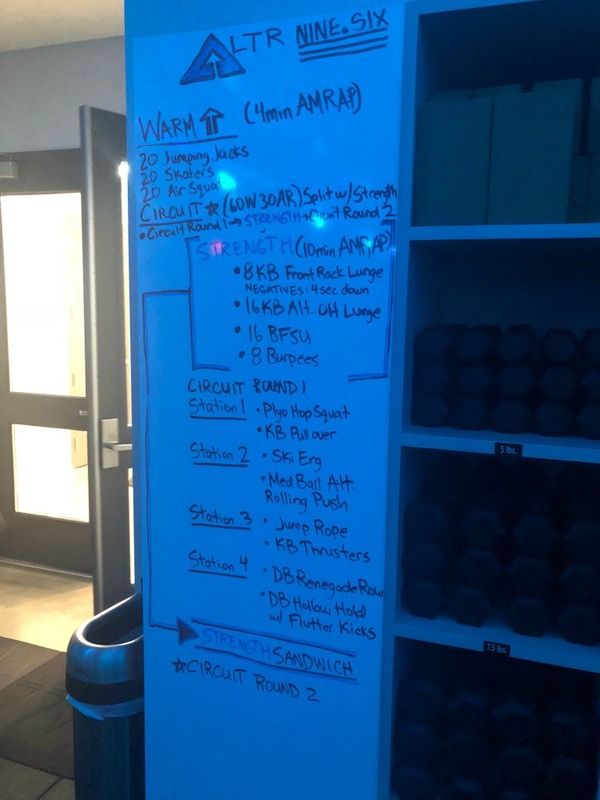 The purpose of this post is to share how my training went this week. If you’re new here, I broke my tibia and fibula on a run in February. The break was 3 weeks before I was supposed to run the Antarctica Marathon. 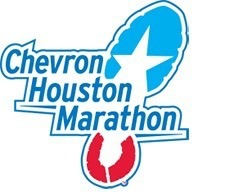 I had surgery and had to take 5 months off of running and am now building back to hopefully run my 30th marathon, the Houston Marathon, in January 2019! Monday: Labor Day! I ran the Victory 10k with my sister Cresta. Her goal was to run it in an hour, and her official time was 1:00:26- very close! 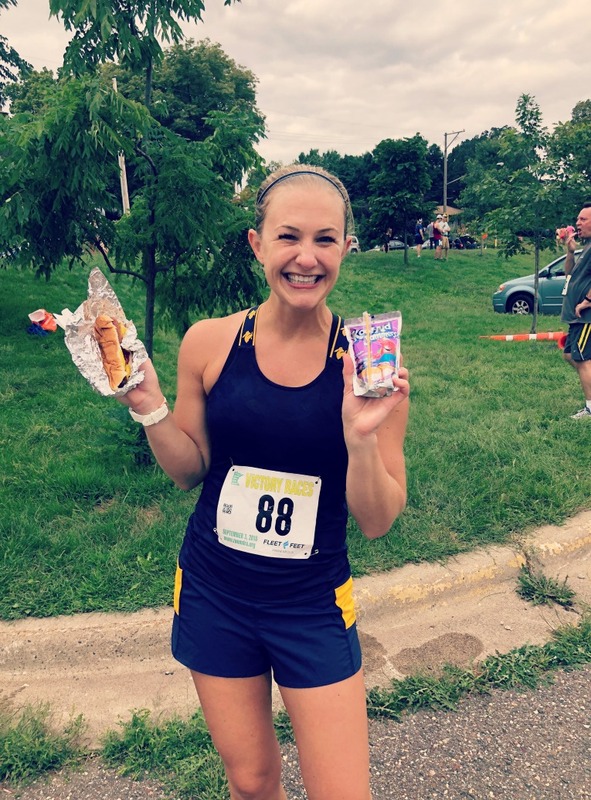 She really pushed herself even when she wanted to quit…well, maybe her pacer (i.e. me) helped a little. It was a fun morning- I love pacing people to achieve their goals! Even though I’m not back where I was before, I am happy to still be able to do things like this. I raced this 10k last year (and many years prior); it’s a great one! It’s a low-key runner’s race. And it’s followed by hot dogs and Capri Suns before 10 am, ha! After the race, we met up with the group that is heading to Houston in January at Surly Brewery for some lunch. It’s going to be an awesome race weekend in Houston! Who else will be there? Tuesday: 10.5 mile run commute. I had 45 minutes easy, 25 minutes moderate, 20 minutes easy on the schedule. It was tough (and long!) to do that before work, but being able to combine it with a run commute made it a lot more doable. 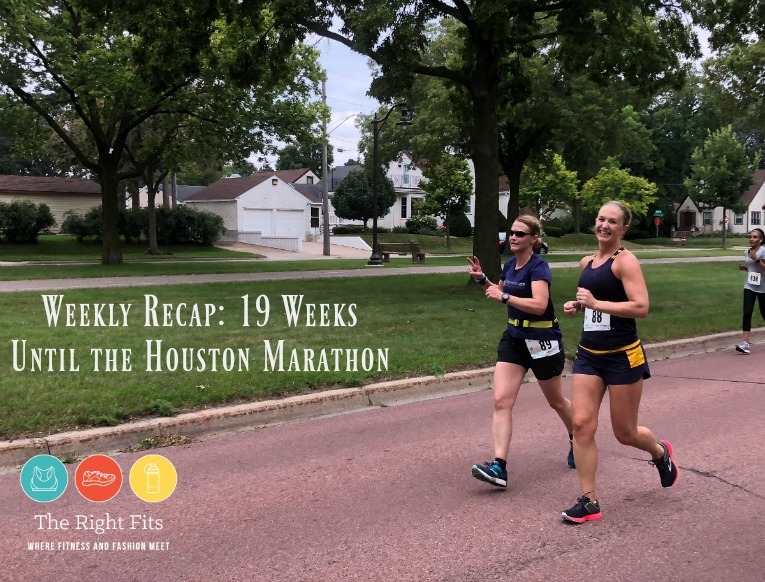 Wednesday: My second Oiselle Volee run! We met at Pryes Brewery at 6 for an easy 6 mile run and then had beers afterwards. Friday: Another “long” run. 10 miles before our flight to Savannah. My coach actually put two 10 mile runs on my schedule this week rather than one before my flight on Friday, as she wanted one to have some moderate miles in it (Tuesday) and then Friday to just be easy miles, since Saturday would be a somewhat harder effort at the wedding 5k. 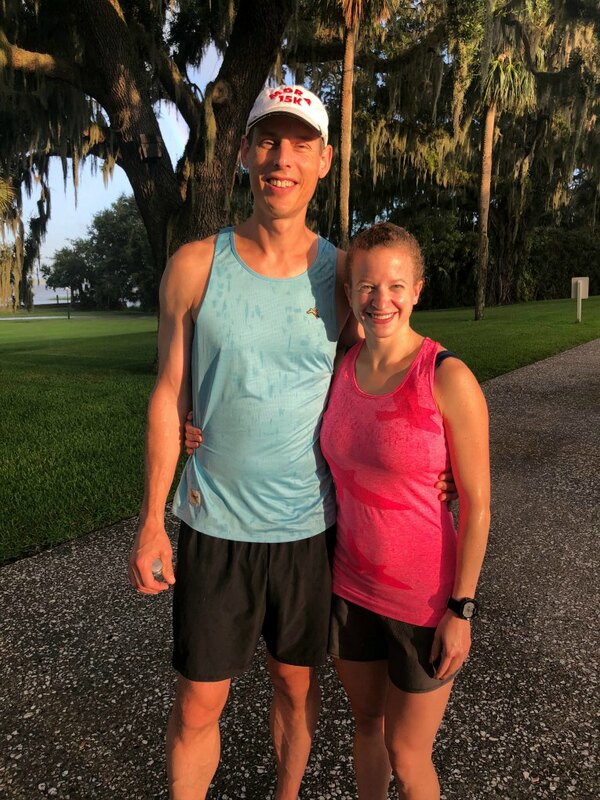 After the morning run (Dustin also did his long run Friday morning), we flew from Minneapolis to Atlanta to Savannah, and then rented a car to drive the 1.5 hours to Jekyll Island. 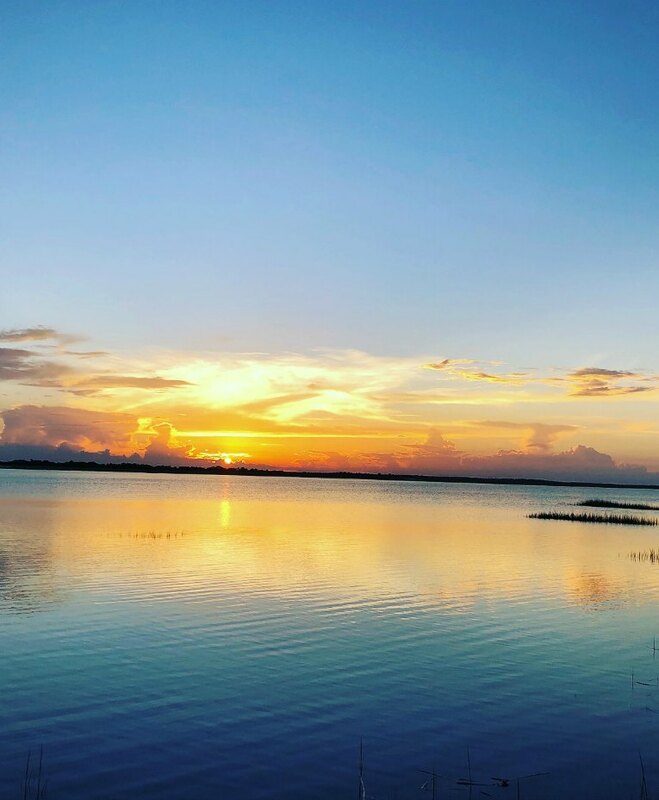 It’s beautiful there, worth the day of travel! 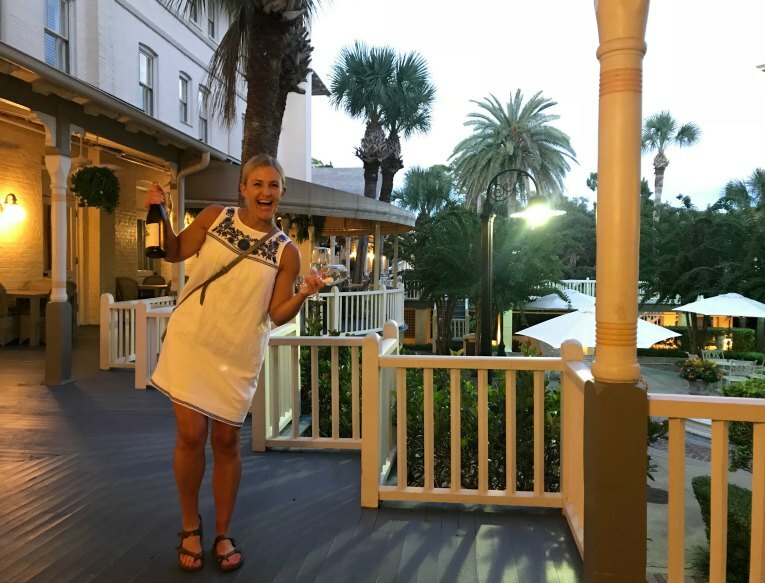 We stayed at the Jekyll Island Club Resort, which is a historical hotel on gorgeous grounds. Saturday: “Beat the Bride 5k”. 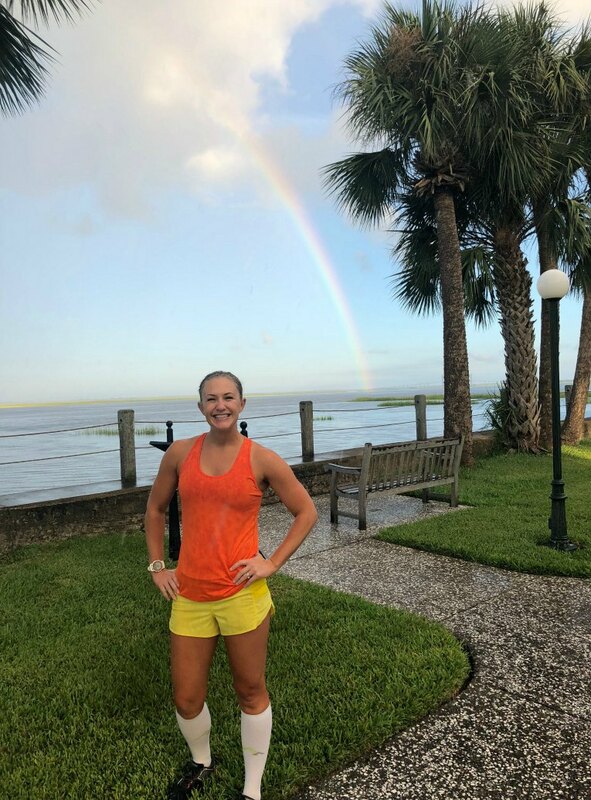 Look at that morning rainbow before the 5k! 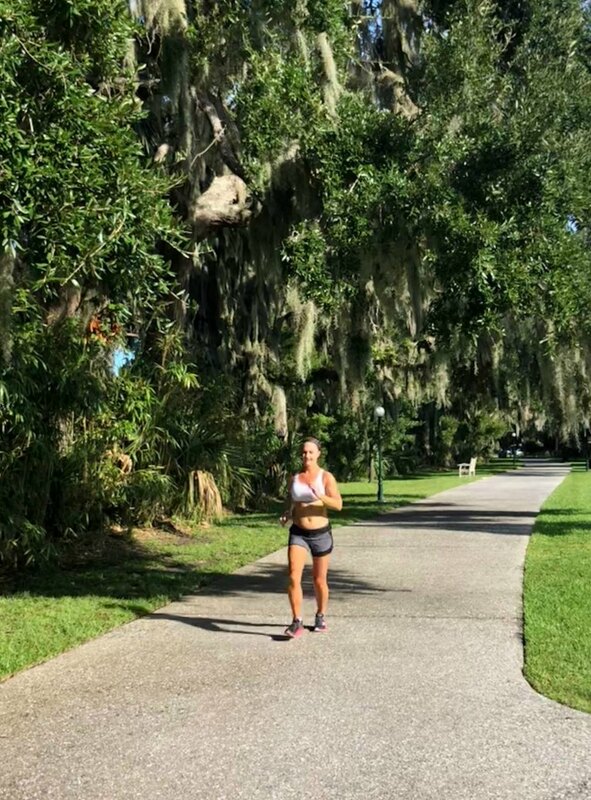 My coach wanted me to run around 8 min/miles for the 5k, which should be totally doable even at my current fitness level during this ‘comeback’, but the heat and humidity on Jekyll Island was pretty intense. I think I ran closer to 8:20 min/mile average and that felt hard enough for me for the morning! The bride still ran around 18 minutes though! She’s very speedy- I think 2:52 is her marathon PR. There were a few guys from our run club at the wedding who could probably beat her if they were racing the 5k, but it was all in good fun and none of them went all out. 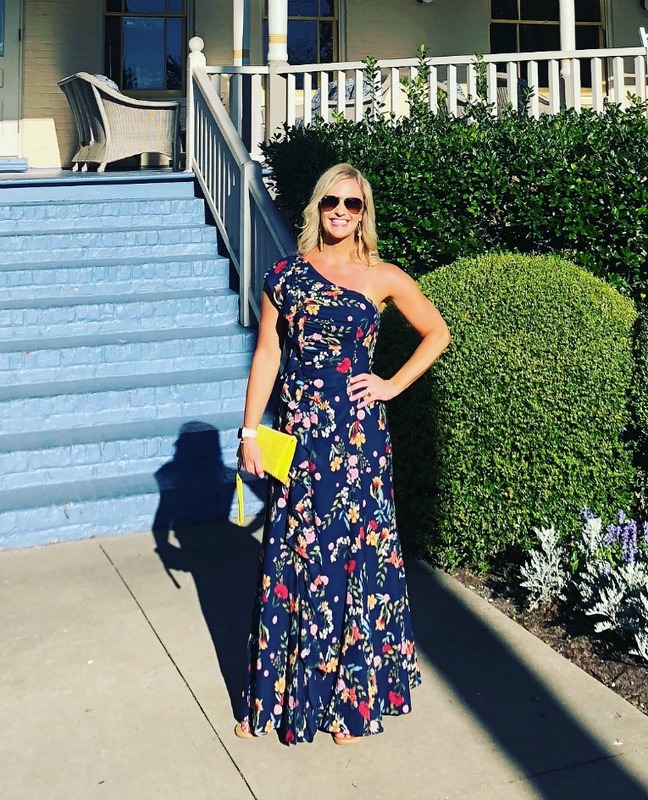 I’ll share more about the rest of time on Jekyll Island in a later post but let me just say that the wedding was a blast. Great food, great music, great dancing…A wonderful celebration. 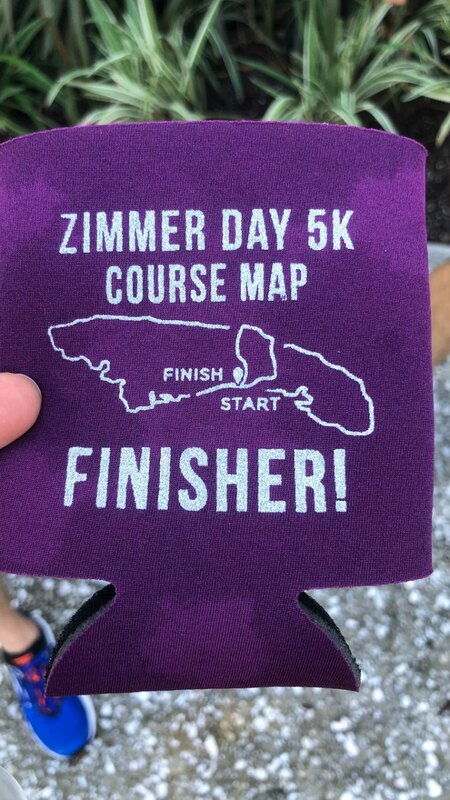 Sunday: Slow & tired (okay, maybe a few two many glasses of wine at the wedding the night before) 4.5 miles run on Jekyll Island. Overall, a decent week, though that tendon in my ankle is still bothering me. I have a PT appointment this week, thankfully. My ankle still gets pretty swollen some days, especially if I do a lot of walking. I am curious how long that will continue. I generally feel okay running and I often ask my running companions if it looks like I’m favoring that leg and they say no, but I do think I might be changing my gait a little and that worries me. Hopefully a check-in with the good people at Mayo Sports Clinic this week will help. 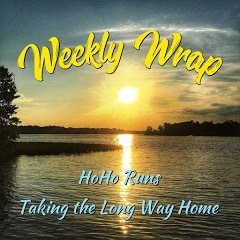 Thanks so much for reading and be sure to check out all the other great weekly recaps that are a part of HoHo Runs and Taking the Long Way Home ‘s weekly recap link-up! That is some serious heat and humidity!! Great recap! Thank you Liz! 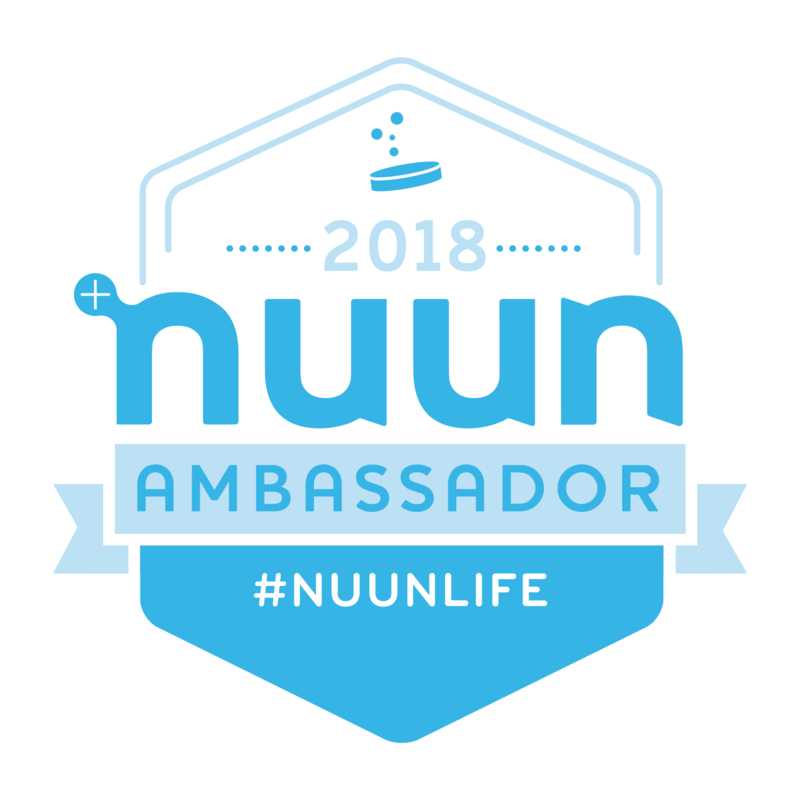 Yes, I love helping other runners, especially friends and family! That looks like a beautiful spot for a wedding! And what a fun idea to do a “Beat the Bride 5k!” Looks like you had a great week. Hope you can resolve any issues with your ankle! So awesome that you were able to run a race with your sister on Labor Day. It looks like it was a fun time too! I’ve heard that Jekyll Island is beautiful! Looks so so so so fun!!! What a wonderful destination for a wedding! I imagine your ankle is still healing. Crazy how long it takes, isn’t it? I remember my son having swelling for a long time after his break. You’re doing really great tho! Ugh, the ankle is still healing and it’s been 7 months!!! The wedding was so great! I haven’t been to Jekyll Island since I was a little girl (grew up in GA). I completely understand what the humidity and heat were like during the coastal 5k and am impressed by your pace. 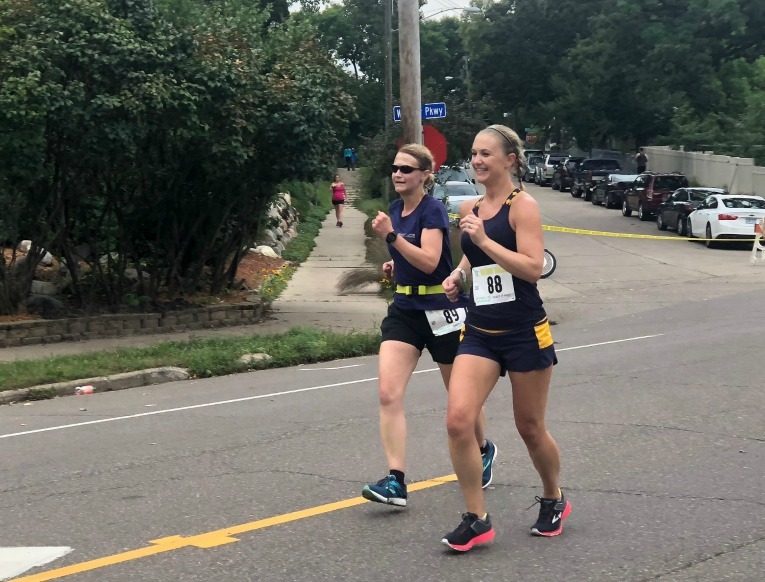 How fun to have the special memory (and awesome picture) of running with your sister. Isn’t it crazy what we’ll eat and drink so early in the day after running a race? Thanks for linking. I honestly hadn’t really heard of Jekyll Island but it was so lovely! But wow.. HOT! I felt bad for the men in suits during the wedding!